Zevia is one of my favorite colas ever. Why? Because erythritol and stevia are sweeteners that don’t make me hungry, don’t make me nervous and jittery, or cause me stomach upset. Plus, since it comes in over a dozen amazing flavors, I’ll never have to have the same drink in to weeks. Talk about variety–and a girl does like to accessorize. Can I get an allelu up in here? I have reviewed their natural colas before here, here and here, and I positively love them. As a matter of fact, while (again) kicking the aspartame habit (again), I have turned to Zevia Cola and to their Black Cherry for respite. I just love the fizzies sans the side effects. And aside from generously filling my life with bubbles, for our Five Year Anniversary, this wonderful natural soda manufacturer has very generously offered 2 cases of Zevia to a lucky Your Lighter Side reader! Two cases! That’s 48 cans of amazing, fizzy, bubbly, flavorful deliciousness that will knock your lips right off of your face, an incredible $48 retail value! My favorite flavor? Mountain Zevia, with a delectable caffeine kick and a light, zesty citrus flavor. But that’s just me. Which of their 14 flavors will you mix and match for yourself? 3. 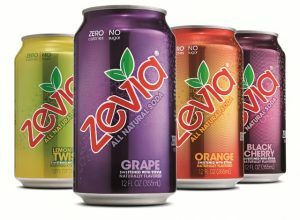 Like Zevia on Facebook, Follow them on Twitter, or sign up for their emails. 4. Email me at yourlighterside@gmail.com with the title Zevia is Zeavenly. In the body of the email, please tell me which social network(s) you shared us with, and how you’re following Zevia’s amazing company. 5. Fanshare Winner Drawing: On Tuesday, July 24, at 12pm MST (Denver, US), I will pick a random winner and email you. Please respond within 24 hours with your home shipping address. Zevia will ship your prize package once I send them your address. I will then immediately delete your home address for personal privacy reasons. Those links sometime require extra hover time. I know they don’t always work for me right off the bat. I have to sometimes try 2-3 times. Sorry for that! A new soft drink? ……..with better sweeteners! Where is I sold…..I can go to the U.S. And shop! The cola has been around for a few years, but it’s taken time to get the word out. The soda is essentially no artificial colors and sweetened with erythritol and stevia! Love them! Thank you! Jamie, you are a dating! SUCRELLE is its name….ZERO carb…not like Splenda that has one carb per packet. Better to keep the carb count lower for real food! Done! Now off to find out where I can find this stuff locally! TY! I’ve never tried this but I have others on Low Carb Friends talk about it. I’ve signed up for their news letter. I receive your newsletter . I have never tried Zevia. Hope I win. That is a great idea, Margareth! Those soda streams look like a lot of fun.